I've been asked many, many questions about our sensory tubs and it seems most of the questions are the same, so I thought I'd write up a little Q&A post. Q: How do you store the things that go in your tub? A: I keep everything separated in jars and clear containers all of which are housed on two shelves in my classroom closet. Q: Do you keep themed items together? A: Sometimes... it depends on the theme. Nearly every bit of material I own is used for multiple purposes (things like puffs, beads, corn kernels can be used for pouring, spooning, etc.) and are not just for sensory tubs. That said, I tend to keep all of the items separated, as I mentioned above. I do, however, keep like items together. For example, Christmas items are generally pretty specific to Christmas, so I keep all of that together in a container in one of my seasonal drawers. Q: Where do you store all of your tubs? A: Up until a month ago I only had ONE tub that I use each month. This means I used the same exact tub each month - I simply fill and empty the tub as needed, returning the contents to where they belong. Given how little time I have these days, I recently added another tub to the roster so I could have it ready to go when the next one ran its course. This has worked out well and it saves me from scrambling to create a new one. As I've mentioned in the past, I have my tubs planned out well in advance, so it's easy for me to create a tub a week or two before it's ready to be used. Q: What kind of box do you use and what size is it? A: I use a clear container that comes with a cover, the kind of storage box you'd find at a Target or Walmart. It's approximately 16"L x 11"W x 6"D.
Q: How do you get your son to keep everything inside of the tub? Q: Are sensory tubs really Montessori? A: I wrote a response to this on my Facebook page, but the short of it is no, sensory tubs are not affiliated with Montessori. They are, however, very commonly used in preschools. While James and I do focus a lot on Montessori work, we enjoy quite a few non-Montessori activities, too; sensory tubs being one of them. They are simply something James enjoys and so I've incorporated them into our schooltime. Q: How do you come up with your sensory tub ideas? Do you have a list you can share? A: I first learned about sensory tubs when I read a post on the lovely blog, Chasing Cheerios, last fall. I searched the internet for ideas and was surprised there weren't many out there. I quickly decided to create a monthly tub and simply sat down with a pen and paper and wrote down as many ideas as I could think of. I'm proud to say that with the exception of the Ice Cream Sensory Tub, the exact theme of all of my sensory tub ideas are my own (oh and my niece came up with some ideas for us, too!). That is, of course, not to say that others didn't think of these themes, too - I mean, it's not hard to think of creating a Christmas themed tub in December. I'm just saying I didn't look to anyone else for inspiration. 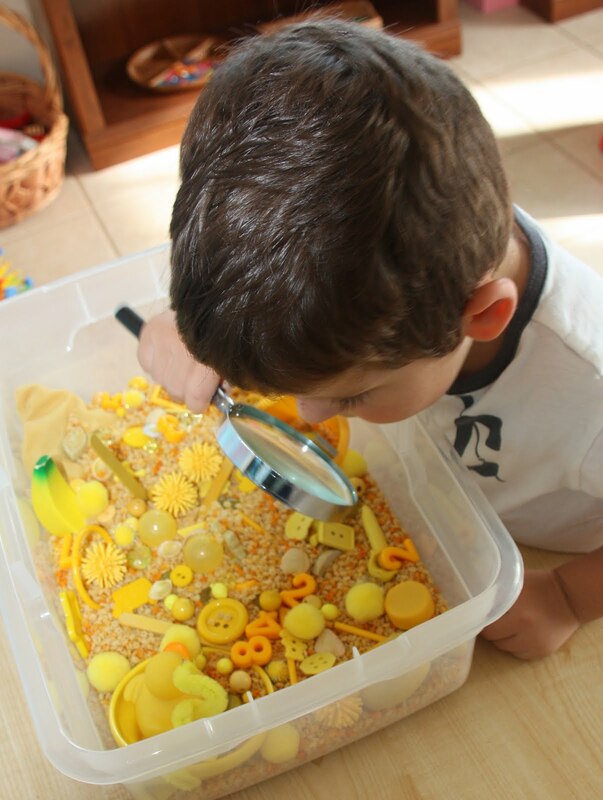 Over time, with the addition of many wonderful teachers to the blogworld, the interest in sensory tubs has spread like wildfire and now you can find creative ideas everywhere! Q: What's the point of sensory tubs? A: I think as adults we're so used to looking at things from a very practical standpoint. If it doesn't have a purpose, what's the point of it? Remember, children see the beauty in simplicity and it doesn't take anything extravagant to please them. A big box of interesting things is ever so intriguing and fascinating to a child. But, if that's not reason enough for you, keep in mind that there's much to be learned from a sensory tub. Children are exploring different colors, textures, sounds and smells, and they are learning to scoop, pour, count, sort and so much more. If you sit with your child while they explore, you can engage them in light and easy conversations based on what you included in the tub (e.g. where you included a little scarecrow in your fall tub you might chat about why farmers use scarecrows) and perhaps introduce them to some new vocabulary (e.g. for a Thanksgiving themed tub you might use the words "cornucopia" or "pilgrims"). You can also just sit back and watch their beautiful imaginations go wild. Sensory tubs have so much potential for imaginative play. I'm always delighted and amused by the kinds of stories James creates with his sensory tubs. Q: What's the age range for a sensory tub? A: Personally, I believe sensory tubs can be enjoyable for anyone of any age. I challenge you to put together a lively tub and not be tempted to sit and sift your hands through it. :) But, keeping common sense in mind, I think you need to be cognizant of a child's tendencies. Young children like to explore with their mouths, so they should never be presented with tiny items as they are chocking hazards. Even if an older child is a "mouther", be sensitive to that and offer up tubs with things that wouldn't be harmful if they were to explore in that way. Even though James (who is 3.5) is not prone to putting things in his mouth, nose or ears, I still make sure I'm in the same room with him whenever he uses his tub. It's just common sense. Q: Can you recommend a good sensory tub theme for a very young child? A: In Montessori, infants and toddlers are offered a basket of large items to explore. Sew Liberated wrote a post about just such a basket. Things like a wooden or metal spoon, a knitted rattle, a ball of yarn, a tin can with beans in it (securely sealed, of course), or a felted ball all put together in a nice basket or box. Always avoid toxic materials (such as plastic). The items in these kinds of baskets are large enough that they don't present a choking hazard and they are safe for oral exploration. Q: Does your son have access to your tub, does he use it whenever he wants? A: I keep the tub in our classroom and James is welcome to use the tub during our schooltime. Click here for a complete list of my sensory tub posts and/or go to my Counting Coconuts Facebook page to view my sensory tub photo album. And be sure to check out this post from Teach Preschool - you'll find instructions on how to make your own sensory table! Very informative Mari-Anne, thank you. Oh and thanks for the link back. You are such an inspiration. My son (just turned 9) loves our sensory tubs as much as the 2 year old lol!! Really informative, thanks! I've been meaning to do a sensory tub for quite a while now, but for some reason haven't. I think perhaps it's the age difference of the children - 4 and 1.5. The eldest would love it, the youngest would eat/throw/tip it everywhere. We might have to bring it out only during youngest's naptime! And the idea of a basket of larger items for a young one is thoughtful too. You are so right on the age range! I made my first real sensory tub last week (similar to your leaf one), and I couldn't resist running my hands through it and sniffing the scented candle I had included. My 9-year-old son saw it and got really excited. He wanted to play with it, and so did my 6-year-old daughter. Gabriela (just turned 3), to my great surprise, wanted nothing to do with it. She played for about 1 minute and was done. She didn't even want it the next few days. I was really disappointed, and Isaac claimed he'd play with it if Gabriela didn't want to! However, after a few days she changed her mind, and now she begs for it! Whew! I was afraid all my efforts were for nothing! Anyway, thanks for sharing your amazing sensory tubs, and I really like the way you organize your materials. Thanks for the post, Mari-Ann! I love your blog. Just to add to the benefits: research shows that sensory play is great for kids who are stressed or come from traumatized backgrounds. We have adopted older children twice and sensory play has been instrumental to their healing. It also is helping my nephew who is separated from his mother right now! This was great. And kudos to you for not limiting yourself to pure Montessori when you find something else that works. Great post, Mari-Ann! You always have such wonderful sensory tubs, and it’s a real service for you to have a post with answers to so many questions. Sarah’s comment was interesting about sensory play for children who are stressed or from traumatized backgrounds. In Jungian therapy, children (and adults) often work with small objects in a sand table as part of their therapy. So who knows just how many benefits there really are to sensory tubs?! Thanks for this post. I just set up our first themed tub today. Before that, I only did dry beans and rice. I'm not sure why, but Little Miss did not like it all. Maybe I didn't select age appropriate textures??? Do you find certain textures to be better than others? My teen loved playing with it though. LOL! I really appreciate how you take the time to answer our questions... I know just how much you have going on!!! Love what you wrote about kids not needing all the bells and whistles to keep them happy, so true! @Sarah: I had no idea sensory tubs could help in that way - how wonderful! Thank you very much for sharing that! @Maureen: I'm not sure there's any one texture that's preferable to another - every child is so different. My son, for example, is not a fan of silk, but most people find it to be an enjoyable texture. I think it's really just about trial and error until you find something that appeals to your little one. I've noticed James really enjoys when I provide a variety of textures and colors in any one tub. Thank you for this super post!! I have just written a "World in a Box" post and have linked back to you and your wonderful sensory tubs!! I am starting to experiment with some sensory tubs with my 3.5yr old who is very interested in dump trucks, diggers and trains etc. Does it add to or defeat the purpose if I allow him to add his choice of appropriately sized toys to play with in the bin or should I restrict him to only the items originally included? I am in awe of you...I would love to put one of these together for my girls. I remember having one for my stepson and he loved it! Thanks so much for sharing your ideas!!! I'm giving you the versatile Blogger award! Please stop by for more details! Thank you for another useful and interesting post. I did my first tub last month - for Halloween. I just wanted to point out a little funny typo that you have in the post though - in the second last answer you suggest to always avoid non-toxic materials (rather then avoiding toxic materials). Thank you again for all your wonderful tub ideas. Thanks for a great FAQ :) I just linked to in on my blog as I've just started doing bins again now that my son is 19 months. My son especially is so into anything sensory that I decided to try a sensory tub yesterday. We used about 15 plastic eggs (the kind that open) with a bunch of pom poms and cotton balls. Both of my kids immediately started to pretend they were baby chicks hatching! Then then would put them back to sleep in their egg "beds". This went on for over an hour straight with repeated visits. Later we added some cups, a magnifier, and tiny nets too. I'm so glad you inspired me to do this. We will make the sensory bin a rotating keeper! Pond: Water, Fish & Frog bath squirters, a sponge lily pad, and a log made from a water bottle covered in brown felt (you could also use a foam block). The babies love splashing & chewing as I sing Speckled Frogs and 3 Little Fishies. "Sand" Box: Saw this idea in the Baby Einstein Great Minds Start Little book.... fill a tub with rice crisp cereal and then hide toys and give them spoons/cups for digging. Fun and a snack too! I Spy Aquarium: Filled our kiddie pool with ball pit balls and a variety of oceany toys. They loved climbing in & out of the pool, "floating" on the balls, and looking for toys. We read a book & then looked for the animals (crab, octopus, fish, etc.). I plan to take photos of the toys to make into cards so we can look for items & learn names. Thank you so much for your blog! I keep referring to it on my blog. I feel like I am just learning how to do all this wonderful exploring and fun that you have going on at your house with your little ones. I am always open to new ideas and fun things to do with my girls to help them learn and have fun. I loved seeing that you kept all your stuff in jars. For a long time now I have been keeping jars to store play stuff in and supplies for projects. I am so pleased to see that you do that too. I love the sight of all those jars filled with endless learning and fun possibilities!!! Thanks again for your inspiring ideas! Where do you get the 'porcupine balls' from? They look fab and I liked your idea of using them in a tweezer activity (in a different post). Thanks for all the wonderful ideas! Lid K: I'm sorry, I can't recall where I obtained those porcupine balls, it's been a few years now. Perhaps Oriental Trading?